Sarah Trevelyan arrives in the sleepy village of Crowsbrook with three suitcases and a burning desire for retribution. Harbouring a dark family legacy of witchcraft, she’s hell-bent on vengeance against Nicholas Carrington, the mysterious man responsible for her best friend’s death. Crowsbrook real-estate developer Adam Carpenter is desperate for success. He’s just made the deal of his life with enigmatic consulting firm Asilida, and Adam’s looking at a future in which he can have anything he wants—anything at all. Everything seems perfect—apart from the strange and sinister voice he’s hearing more and more often in his head. 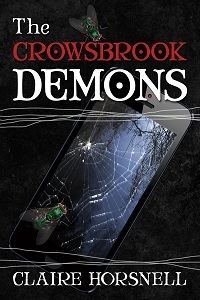 The Crowsbrook Demons is the first in a series of books set in and around Crowsbrook.